The design lets the 777X dock at regular airport gates despite larger wings. Passengers on Boeing's new line of 777 planes might not have to take a bus from the gate across the tarmac, despite much larger wings potentially making it difficult for the aircraft to navigate terminals. That's because the company received Federal Aviation Administration approval today for its folding wingtips -- those will let the planes stop at airport gates big enough to accommodate typical 777 models. 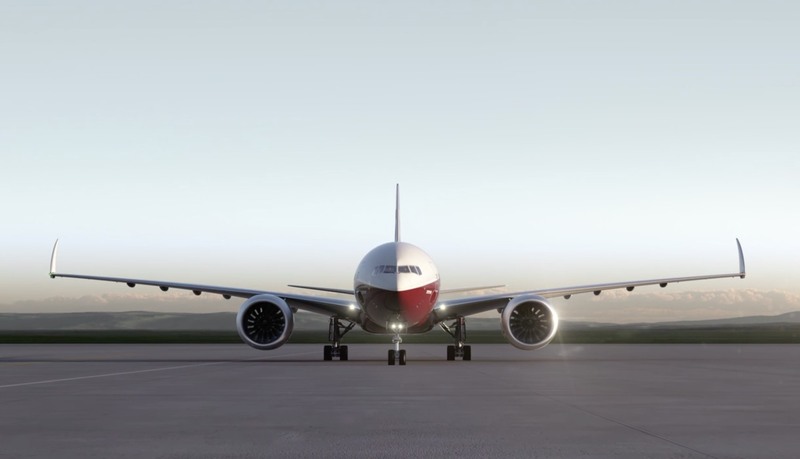 Once the 777X lands, the wingtips will rotate until they point upwards. Bloomberg notes that the plane will be the only commercial model in widespread use to have such a feature. Some smaller planes have foldable wings, including military aircraft that have to take up as little space as possible on aircraft carriers. NASA, meanwhile, is testing folding wings that adjust midair for supersonic flights. The 777X's wingtips are so novel that US regulators had to draw up new standards for them. The FAA rubber-stamped those measures Friday. The agency was concerned that the wingtips could cause safety issues -- some plane crashes occurred after pilots did not secure flaps on wings before takeoff. The FAA required Boeing to have several warning systems to make sure pilots won't attempt a takeoff before the wingtips are locked in the correct position. The FAA also wanted assurances that there was no way the tips would rotate during flight, and that the wings could handle winds of up to 75 miles per hour while on the ground. The new wings are made from carbon-fiber composites that are stronger and lighter than the metal Boeing uses in other wings. That lets the company increase the wings' width by 23 feet to 235 feet, which makes flying more efficient. These are the widest wings Boeing has attached to a plane, surpassing the 747-8's 224 feet. However, it doesn't hold the record for a commercial plane: the Airbus A380 has a 262-foot-wide wing, which forced some airports to install gates specifically to accommodate it. The FAA's decision moves the 777X closer to a commercial reality, four and a half years after the plane was announced. There was a setback recently, though: there was a three-month delay in starting trials of the engine, which General Electric is supplying, largely because of a compressor problem. There's been a delay with the wings too over a longer-than-expected process in crafting structural ribs, though Boeing hopes to be back on track by summer. Despite the hitches, Boeing is still working towards the 777X's first flight, which is scheduled for Q1 next year. Commercial departures won't take place until at least that December.